The 2018 Farm Bill negotiations included a broad spectrum of policy perspectives and priorities. Given the tight budget environment, decisions over which program areas to cut were contentious. Federal food assistance programs are a major part of the Farm Bill budget, comprising 79.9% of spending in the 2014 Farm Bill. The 2018 Farm Bill will determine funding and program requirements for participating in the Supplemental Nutrition Assistance Program (SNAP) over the next five years. In 2018, potential cuts to SNAP have dominated Farm Bill debates as have the work requirement for program eligibility. On June 21, 2018, the U.S House of Representatives passed the Agriculture and Nutrition Act of 2018 which includes major funding cuts as well as work requirements for eligibility for the program. On June 28, 2018, the U.S. Senate passed the Agriculture Improvement Act of 2018. Now the two bills will go to a conference committee in order to reconcile the differences between them. The current Farm Bill expires on September 30, 2018. The Agriculture Improvement Act of 2018 passed out of the U.S. Senate Committee on Agriculture, Nutrition, and Forestry with bipartisan support on June 13, 2018, and on June 28, 2018, the legislation passed on the U.S. Senate floor by a strong majority vote, 86-11. The Senate legislation does not include the stricter work requirements contained in the U.S. House of Representatives’ Farm Bill legislation and does not include any significant budget cuts to the program. 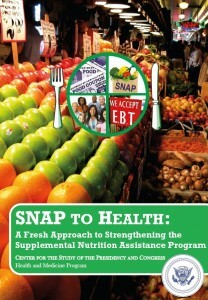 The Senate bill expands a 2014 program that provided job training for SNAP participants. The legislation also makes it easier for retailers to receive participant discounts for providing healthy foods to SNAP beneficiaries. The bill was met with much more support than the House version.